Confused about which camcorder to buy? Asking yourself, which camcorder should I buy? This camcorder buying guide will help you narrow your choices from the bewildering array of cameras down to what is best for you. The modern camcorder is compact, lightweight and extremely portable. Whether it's a family wedding, your baby's first steps, or an unforgettable vacation, a camcorder lets you record and play back those memories over and over again. See: how do I hookup my camcorder to a TV here. Camcorders are evolving all the time. New features and improved image quality seem to supercede the current crop even before you've broken in the model you just bought. This is good in most ways because improvements usually mean better video and more capabilities. However, the wide range of camcorder formats and technology means the consumer must wade thru a lot of information in order to make an informed choice in video cameras. In some ways, it doesn't really matter which camcorder you choose today as long as you get a new digital model from a top manufacturer like Sony, Canon, JVC or Panasonic. You'll get good video recordings regardless of the format or media type of the camcorder. But remember, you always get what you pay for. Pay less, get less. Pay more and get more. Try to avoid the bargain low-end models. Most of all, try to determine how you'll be using the camcorder and what your needs will be to meet your goals.  What do camcorders offer me today? Older analog camcorders such as VHS-C or the 8mm tape camcorders are not being sold today. Those who have these older video tapes need to think about converting them over to a newer format. Generally you do not find anymore in stores the mini-DVD camcorders or even the Mini-DV tape camcorders. Camcorders for consumers today are almost all digital models with many new features. Most consumers are heading towards the HDTV High-Definition arena and want a camcorder to record in HD and playback in HD in order to get the best video quality available today. In 2011 we see camcorder formats which just a few years ago were cutting edge technology, not being sold anymore. This includes the tape-based formats like Mini-DV and the disc-based formats like DVD. Now, at least for the average consumer, we see mostly just two camcorder formats, namely the flash based and the hard-disk based camcorders. Dominating the field is Sony, Canon, Panasonic and few others. Flash memory camcorders use internal memory (micro-chip) or an external memory card or both to store video and audio. The hard disk camcorders use an internal hard disk to store video and audio. The capacity of the storage media in camcorders today is large, but with high definition needing more storage than standard definition, you still need enough for hours of video. The advantage of the flash memory is no moving parts to break and the ability to replace with another memory card for an unlimited amount of storage. How much can I store on a memory card? A good rule of thumb is one hour on 8GB at good video quality for high definition and almost two hours for standard definition. An HD camcorder allows you to record at several different video quality settings giving more time for less quality. 32GB at good video quality would give you four hours for high definition. 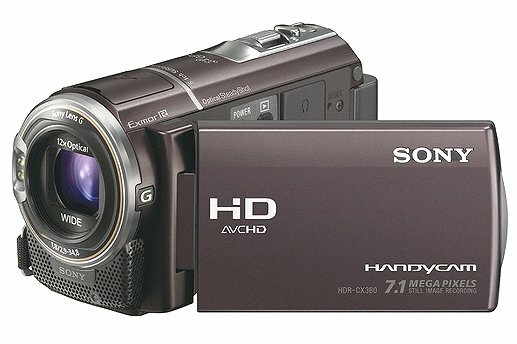 You can record over 32 hours in HD LP mode using the 96GB HDR-CX700 Sony camcorder. So you can see that you can record a lot of video on these camcorders. You can also store still photos on the memory cards. How much do memory cards cost? Costs are always going down for lower capacity cards as higher capacity cards are introduced. 1GB or 2GB cards are now becoming very common and can cost under $15 while 32GB cards may go for $40 or more. Prices vary depending on where you buy. 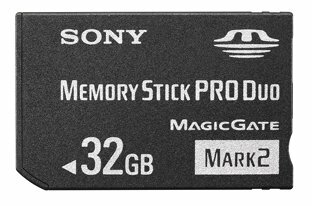 The Sony memory stick Pro cards often cost more than the SD type cards but Sony, in 2010, started using the SD type cards in their camcorders. Always check your owner's manual for compatibility of memory cards. 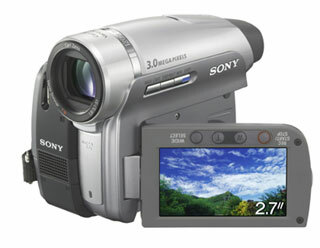 Sony offers a full lineup of camcorders for 2011 including bloggie, SD, HD, projection and even 3D camcorders. Prices range from $179 to over $1400. So there is something for everyone. The bloggie pocket-sized models are for those who want web-based videos. The projection models allow you to project your videos on a wall. The High Definition models record 1920x1080 video resolution in AVCHD compressed format or SD standard definition on either a hard disk drive HDD or flash memory. New standard definition models from Sony include the DCR-SX85, DCR-SX65, and DCR-SX45, which are all updates on 2010’s SX83, SX63, and SX44 respectively. The DCR-SX85 includes 16GB of internal memory and will sell for $279. The DCR-SX65 contains 4GB of internal memory and has a price tag of $249. The memory card-only DCR-SX45 will sell for $229. Available Feb. 2011. The flagship HDR-CX700V comes with 96GB of internal memory and has a suggested retail price of $1299. The step-down model, HDR-CX560V, has 64GB of internal memory and a $1099 price tag, while the HDR-CX360V includes 32GB of internal memory and will sell for $799. The HDR-XR160 is the new hard drive camcorder from Sony in 2011 and it includes a 160GB internal hard drive ($599 MSRP). The entry-level HD models are the HDR-CX160 (16GB internal memory, $499 retail) and the HDR-CX130 (no internal memory and a $449 price tag). All of these HD Handycams are available March, 2011. In updating its entry-level HD Handycams, Sony released the HDR-XR160, HDR-CX160, and HDR-CX130 (replacements for the XR150, CX150, and CX110 camcorders). These new camcorders feature 30x optical zooms (up from 25x), built-in USB connectors, optical image stabilization, and 60p recording. An external microphone input is available on the HDR-CX160 and HDR-XR160. Sony also unveiled a new tracking focus feature that will be found on all HD Handycams. The feature is similar to the AF/AE tracking option found on Panasonic camcorders as well as the tracking feature that Canon included on select Vixia camcorders in 2010. Sony didn’t change much in terms of sensor size or pixel counts with its new Handycams, but it did add a few new features. A new 24p and 60p record mode is available on the flagship HDR-CX700V, as well as the HDR-CX560V (replaces HDR-CX550V) and the HDR-CX360V (replaces HDR CX350V and HDR-CX300). All three of these models also feature 3-inch LCDs. The ultra-compact DCR-SX45 features a 3.0” touch-screen LCD (230K), a built-in LED video light, as well as a professional-quality Carl Zeiss Vario-Tessar lens, which delivers sharp, high-resolution images and powerful 70x extended zoom that lets you capture extremely tight shots, even from far away. Extended Zoom works in conjunction with 60x optical zoom to get even closer to the action while maintaining image quality. The professional-quality Carl Zeiss Vario-Tessar lens is designed specifically for compact camcorders. Precision ground optics help maintain the sharpness and contrast of larger lenses, and SteadyShot image stabilization helps reduce blur caused by camera shake. The 3.0” touch-screen Clear Photo LCD Plus display provides exceptional viewing clarity with 230K pixels resolution. The display rotates up to 270 degrees for multiple viewing angles, as well as provides sharp, detailed images for monitoring or playback. The convenient touch panel allows easy access to menus and additional functionality such as spot focus and spot metering. Steadyshot image stabilization with Active Mode allows for a greater degree of image stabilization over the well known, Sony developed, SteadyShot stabilization that has been used for years, giving you more stable video even when on the move or in low light circumstances. The built-in zoom microphone focuses audio recording on your subjects with the camera's zoom lens, helping memories ring true with clear dialogue and crisp, discrete sounds. The DCR-SX45 features an LED light that can assist in low-light situations giving you more flexibility when capturing your video. The high-speed, built-in USB 2.0 cable allows for easy connection to your computer without having to remember separate cables. It also fits conveniently into the hand strap so it’s out of the way until you need it. Store your memories in a whole new way with the ability to copy videos from your camcorder directly to an external hard disk drive3 (sold separately), all without a computer. Your camcorder can also access videos stored on the external hard drive for playback on your TV, allowing you to utilize the camcorder’s handy playback features. Sony Picture Motion Browser software offers a simple, intuitive way to transfer, sort, and view your video and still images on your compatible PC. In addition, multiple output options let you burn your memories to DVD, as well as take advantage of one click upload to a number of popular video and photo sharing sites. The automatic lens cover protects the Carl Zeiss Vario-Tessar lens from scratches during transport or while not in use by closing the lens cover automatically when the camera is shut off. With Film Roll Index, the camcorder previews the beginning of scenes and creates scene indexes set at specified display intervals (3, 6, or 12 seconds and 1 or 5 minutes). Face Index indexes your video footage according to the faces detected in each scene. When it’s time to play back video, simply search for what you want by selecting from among the detected faces displayed in the index. For convenient storage and sharing of your images and videos, the DCR-SX45 accepts Memory Stick Duo / Memory Stick PRO Duo / Memory Stick PRO-HG Duo media and SD/SDHC media (sold separately). Requires Microsoft Windows XP SP3/ Windows Vista SP2/ Windows 7. Not supported by Mac OS. PMB Ver. 5.5 Supports Windows XP Service Pack3 (SP3) (32bit), Windows Vista Service Pack2 (SP2) (32bit/ 64bit), Windows 7. PMB software is not supported by Mac OS. Supplied Software PMB Ver. 5.5 Supports Windows XP Service Pack3 (SP3) (32bit), Windows Vista Service Pack2 (SP2) (32bit/ 64bit), Windows 7. PMB software is not supported by Mac OS. Windows XP SP3 * /Windows Vista SP2 ** /Windows7 * 64-bit editions and Starter (Edition) are not supported. The Windows Image Mastering API (IMAPI) Ver. 2.0 or later is required to use the function for creating discs. ** Starter (Edition) are not supported. Standard installation is required. Operation is not assured if the above OS has been upgraded or in a multi-boot environment. Import and upload to the web to share moments with friends and family. Sony’s three new Bloggies (from left to right): Bloggie 3D MHS-FS3, Bloggie Duo MHS-FS2, and the Bloggie MHS-FS1. The Bloggie 3D FS3 comes with a launch price of $249 and has the same 1/2.5-inch CMOS sensor that is found in all of Sony’s Bloggie camcorders. The model is equipped with two sensors and two lenses, however, which definitely sets it apart from the crowd (both visually and specs-wise). In addition to offering 1080p Full HD 3D recording, the Bloggie 3D FS3 can also capture still photos in 3D. The camcorder has a 2.4-inch LCD, a stereo mic, and 8GB of internal flash memory. According to Sony, the Bloggie 3D should be compatible with all 3D TVs and it should also display content fine on regular 2D televisions. 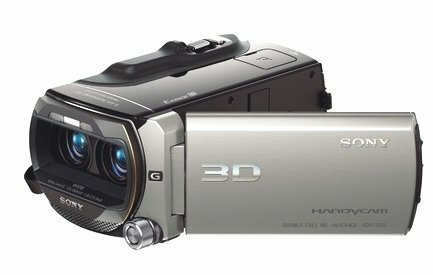 For those who don’t want to record 3D, the new Bloggie Duo FS2 offers a different unique feature: a 2-inch, front-facing LCD. The camcorder still has a 2.7-inch screen on its back that is used for regular recording, but the front-facing screen is ideal for making recordings or taking photos of yourself. This is essentially the same concept as a rotating LCD that allows you to look at yourself (like a mirror) while you record. The Bloggie FS2 also comes equipped with an LED light, 4GB of internal memory and a built-in battery that charges via USB. The new entry-level Bloggie FS1 is similar to the FS2 except that it lacks a front-facing LCD. The camcorder’s dimensions are 15 × 55 × 108mm, which makes it nearly identical in size to 2010’s Bloggie Touch camcorders. The Bloggie FS1 has an autofocus mechanism that will switch to macro focus when you’re recording close-ups, and it includes 4GB of internal memory. It, like all Bloggie camcorders, comes with built-in software that is compatible with both Macs and PCs. The Bloggie 3D MHS-FS3 will retail for $249 and is available in April, 2011. The Bloggie Duo MHS-FS2 carries a $169 price tag. The entry-level Bloggie MHS-FS1 has a cheaper MSRP of $149. In addition to these three new Bloggies, Sony will continue to offer 2010’s Bloggie Touch models TS20 and TS10 in 2011. The video is compressed using the MPEG-4 AVC/H.264 standard, which greatly compresses the video without losing much in the way of quality. The audio is compressed using the Dolby Digital AC-3 or the Linear PCM (Pulse Coded Modulation) standard--each standard allows for up to eight channels of surround sound, while also keeping the file size small. The following table shows some of the older formats as well as the new formats. 1. DVD - records to 3 inch DVDs 1.4GB/side, 500 lines of resolution, play DVDs on most home DVD players or direct to TV. Standard Definition video. Record 20, 30 or 60 min per side. Direct access to video scenes. Digital recording in MPEG-2. These type of camcorders are prone to problems with reading the discs and are not as reliable as some others like tape or memory card based models. 2. MiniDV - records to mini cassette tape, 500 lines of resolution, playback to TV or copy to full size DVD. Standard Definition video. Record 60 or 90 min. Sequential access to video scenes. Digital recording in DV format. 3. High-Definition - records to cassette tape HDV/MiniDV or DVD 3-inch dual-layer 2.6GB or Hard Disk Drive or memory card, 720p or 1,080i lines of resolution. High Definition video. Playback to HDTV. Record 60 min to tape, up to 55 min to Dual Layer DVD or up to 11 hours on 30GB Hard Disk Drive or nearly 3 hrs. on memory card. 4. Hard Disk Drive - records to built-in hard disk drive (HDD) 30GB, 40GB, 60GB or 100GB for 4 hours to 41 hours of video, offload to full size DVD. Standard Definition video (or High Definition video depending on model). Don't let the wide range of camcorder choices depress you. Simply consider what matters most to you.  Do you want absolute minimum cost? A Mini-DV camcorder would be good for you. However, these formats are mostly phased out so keep this in mind.  Are you after minimum size and weight but still obtain top video quality with ability to edit your video recordings? MiniDV is your best choice.  Do you want compatibility with a DVD player and thumbnail quick scene access with stable, reliable media? Go with a DVD camcorder.  Is PC-friendliness and no need for tapes or discs most important to you? A hard disk camcorder is good for you.  Do you demand maximum video resolution or HDTV image quality? Go with a High Definition camcorder. When shopping for a camcorder you can easily become confused when trying to figure out which one to choose, as the wide array of options and features available can be overwhelming. Most models include color viewfinders, flip-out color LCD view-screens, digital and optical zoom lenses, electronic image stabilization, re-chargeable battery and digital still recording. Camcorders today use various media to record video and audio. Some camcorders use magnetic tape in a small videocassette while others use a small DVD. Still others use a built-in hard disk drive, eliminating tape and disc media altogether. Then there are the High-Definition camcorders which can also use tape (HDV) but record video appropriate for an HDTV. High-Definition camcorders are now using DVD media also and internal hard-disk as well, but be careful with compatibility as the recording method may be difficult to edit or playback on other devices. This camcorder guide is designed to help you learn about the differences between each of the principal camcorder formats and the camcorder types you'll come into contact with as you research the multitude of makes, models and formats available. When you put a VHS tape into a home VCR, you've selected a videocassette in the appropriate format for the VCR. The format is said to be VHS. As with analog formats like VHS, so there are digital recording formats. The choices you have encompass magnetic tapes of various sizes, optical disc (DVD), hard disk and solid-state formats. An example of a tape format is Mini-DV, the most popular consumer digital camcorder format from 2000 to 2006; DVD is the standard optical disc-based format due to the universal acceptance of DVD in the home, but now we see a rise in the adoption of formats that use neither tape nor discs. Among these are the HDD (Hard Disk Drive) format used in models like the JVC Everio, SONY DCR-SR42 (30GB), DCR-SR82 (60GB) and the memory card formats like the Sanyo Xacti or the Sony HDR-CX7. You can record up to 14 hours of TV quality video on a 60GB hard drive or up to 41 hours of lesser quality video without re-loading tape or disc. Consumers have a wide range of choices in camcorders today, both from a technological point and from a brand perspective. Basically there are two categories, Analog and Digital. Within each of these two categories, you have a variety of formats. The various formats use different size magnetic tape media or optical disc media as well as built-in hard disk. Each is, for the most part, incompatible with the other both physically and technologically. There are a dozen camcorder formats but the most popular has been MiniDV with DVD-based models coming up fast. As you shop around, you'll notice the majority of camcorders available today are digital. Prices of digital camcorders have dropped below $400, making your decision to go digital easier than ever before. When choosing a camcorder, you will want to pay special attention to the format of the camera and its corresponding technology and media. Costs go from $200 for a low-tech model to over $2,500 for a high-tech model, with the median being around $500 for a good digital model camcorder. Current model MiniDV camcorders cost around $300 for a low-end up to about $600 for a full-feature model. Make sure you look for a camcorder with all the accessories you need such as charger, AC adapter, software, connecting cables, owner's manual, carrying strap, battery, remote control, memory chip for still images and warranty. Also, consider an accessory light for shooting video indoors. 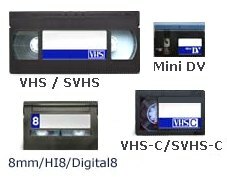 MiniDV cassettes are recorded in the popular DV standard or high-definition HDV, while discs (DVD), hard drives and Microdrives save in MPEG-2 video. Others use MPEG-4. The type of format used dictates the design and the feature set of the camcorder, in addition to affecting what you can do with the video once it's shot. If you plan on editing your video on a personal computer (PC or Mac) you should learn about what is required to do this, particularly regarding compatibility, both hardware and software. Many camcorders use a flash memory card in addition to the main recording media to save still shots and Web-quality video clips. Again, these tiny chips are evolving all the time. Capacities are going up to meet the demand for higher quality images. The tape-based Mini-DV camcorder, although being an older format, is a good choice both for price and video quality and also for ease of editing. You can copy your video to a standard DVD for playback or connect directly to a TV set or VCR. Video quality is excellent at 500 lines. Audio is excellent as well, typically stereo. It's not hard to see what makes MiniDV so popular. Because it's digital, you get much sharper images than analog, plus far crisper, more vibrant color. Digital video can also be copied into a computer without any loss in picture quality. The Firewire / i.LINK® DV interface makes it possible. MiniDV has become so popular, it's the de facto industry standard. So you'll find a choice of models all the way from ultra-affordable, ultra-small camcorders to top models. There are even models you can use as a webcam via USB interface. Also, because MiniDV is popular, there's a wide choice of compatible PC software ready to edit your MiniDV tapes. Another reason to choose MiniDV is the media. As the "mini" implies, the cassettes measure just 2 x 2.75 inches, or about one twelfth the size of VHS cassettes. That makes them even smaller than the cassettes used for Hi8™ and Digital8® recording, which are a fifth of the size of VHS cassettes. They're also affordable and available in convenience stores, drug stores, and supermarkets. All of which makes MiniDV great for anyone who wants high quality and small size at a reasonable price. The MiniDV format records standard-definition video to video-cassettes (magnetic tape) about 2 X 3 inches (65 x 48 x 12 mm). You can fit a few of them in your shirt pocket giving you 60 minutes or 90 minutes of recording each. The cassettes cost about $5 each. Both the tapes and the camcorders are inexpensive: You'll pay about $280 or more for a MiniDV camcorder, and you can import the video into a PC with a FireWire (or iLink) input, and then write it to DVD. But finding particular bits of video on a tape is difficult: You have to fast-forward and rewind to find your favorite segments if you haven't yet edited them. Pros: These camcorders are inexpensive, reliable, and widely compatible.  CD-quality 12- and 16-bit PCM (Pulse Code Modulation) sound capture and audio dubbing.  Broad range of camcorders, from bargain to professional three-chip models.  Widely supported by video-editing and -effects software. Cons: Finding a particular spot on a tape is a pain. It is possible to unintentionally record over video you wanted to keep. Videocassettes have become smaller and smaller from the very large VHS cassette to the 8mm and VHS-C to the tiny MiniDV. The cassette tape can be recorded on over and over again which is good however you have to be very careful not to record over video you wish to save. The drawback with any magnetic tape based camcorder is the difficulty finding a particular spot of video on the media. Fast forwarding and rewinding are not the best way to locate a desired area of interest. Another con is the tape itself which can jam in the internal mechanical parts of the camcorder, although this is not usually a concern. Get a high-end MiniDV camcorder with an excellent lens and you'll get 1 hour per cassette of high quality video and audio. MiniDV has a good track record (more than 10 years) and is compatible with most editing software on personal computers. Many consumer digital camcorders use MiniDV cassettes, which record DV-format video. The DV standard produces high-quality footage that is superior to video recorded by consumer analog camcorders and can deliver more than 500 lines of horizontal resolution, depending on camcorder quality. Consumer and semipro camcorders that capture high-definition video record HDV-format video on MiniDV cassettes. Supporting manufacturers: Canon; Hitachi; JVC; Panasonic; Samsung; Sharp; Sony. Hollywood movies come on 5-inch (12-cm) discs, but DVD camcorders record onto smaller 3-inch (8-cm) discs that slip easily into a shirt pocket. Additionally, Hollywood DVDs use read-only discs; your home movies are recorded onto writable and rewritable 3-inch DVDs. Tape is a "linear" format that requires you to fast forward and rewind to get from scene to scene. In contrast, DVD is nonlinear and provides instant access to any recorded clip. Thanks to non-contact laser recording and playback, DVDs are also highly durable -- which is an important consideration for precious memories. Single-sided 3-inch DVDs cost about $3 to $4 each and hold 20, 30, or 60 minutes, depending on your video quality setting. Because the 3-inch discs are so small, DVD camcorders also tend to be compact. DVD recording is digital recording -- that means far sharper images than analog video as well as clearer, more lifelike color. The DVD's digital video is also appropriate for making bit-for-bit copies on a personal computer. Simply insert the DVD into a PC drive and connect the camcorder to your PC via the Firewire or USB 2.0 cable. In this configuration, you can also use the camcorder as an external DVD burner for your PC. DVD camcorders record high-quality MPEG-2 footage directly to a mini DVD-R, DVD-RW, DVD+RW or DVD-RAM disc and can deliver more than 500 lines of horizontal resolution, depending on camcorder quality. High-Definition models record 720 or 1080 lines of resolution and can use dual-layer 8cm DVD media. DVD camcorders record standard-definition video to smaller versions of the same discs on which you watch movies. This means that you could pop the tiny 3-inch DVD out of the camcorder and into a set-top DVD player. However, the video that mini-DVD cams record is more heavily compressed than that of Mini-DV camcorders, and it's more difficult to edit; many video editing programs can't import the video. Record directly to DVDs for hassle-free shooting, editing and playback. DVD camcorders allow you to record directly to DVD, which means you’ll never accidentally record over video you want to keep. You can find and play your favorite scenes without rewinding or fast-forwarding. Also, you can quickly and easily make copies to share with family and friends. Secure Memories: There's no fear of accidentally recording over previous footage. Lasts Longer: DVDs are durable and don't suffer from wear and tear during usage. A DVD that can be written to only once, that is, cannot be recorded over again. (the data can't be erased). Capacity: 1.4GB. A DVD that can be written to over and over again - up to 1,000 times. Not all DVD-ROM drives or players can read them. Capacity: 1.4GB. Like DVD-RW, only faster. Unlike DVD-RW, you can write to DVD+RW media before formatting is complete. Only newer DVD-ROM drives or players can read these discs. 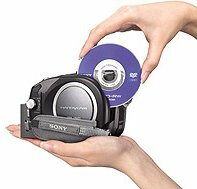 For use with Sony's AVCHD DVD Handycam, this 8cm Double Layer DVD+R disc provides up to 45 minutes of high-definition, SP mode recording. AccuCORE media are 100 times more scratch resistant than standard discs, ensuring outstanding video protection and reliability. Its optical organic dye and enhanced moulding process raise the standard of quality for digital video recording. 2.6GB capacity. DVD camcorders offer a variety of ways to store your family memories on safe, durable DVDs for viewing, sharing or archiving. These digital video devices allow you to record superior quality video in the palm of your hand. 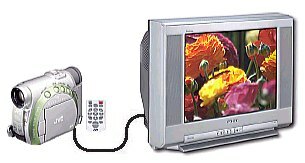 VIDEO Mode: Uses both DVD-R/RW and DVD+R/RW media. You can play the media in most current model DVD players. VR Mode (Video Recording): Only available when using DVD-RW media. You can perform limited video editing directly in the camera without using external editing equipment. Discs recorded using VR can be edited on your DVD camcorder, but they offer very limited playback compatibility with your home DVD deck and other DVD playback devices.  Take the disc out of your camcorder and put it into most home DVD players and watch it like other DVDs.  Watch video directly in the camera using the LCD screen or viewfinder.  Connect your camera to your TV (via supplied cables) and watch video on the big screen.  Take the disc out of your camcorder, put it directly into your PC's DVD drive and watch your video on your PC. Note: If your PC doesn't have a DVD drive, you can use a USB 2.0 cable to connect the camera to your PC and view your video on your computer. Another type of media that you'll likely come across is DVD+R and DVD+RW discs. These have similar capabilities to DVD-R and DVD-RW discs, but they allow you to view your video without "finalizing" the DVD. DVDs offer high-quality video and audio playback with nearly twice the resolution of old video formats like VHS. This high-quality data is stored on a small disk that is easy to store and transport, so you can conveniently save years of memories in a small case or cupboard and send video of your children's activities to their grandparents without paying a fortune in shipping. A DVD is read with lasers, so it is not physically touched while it plays. This reduces wear and tear and also makes it easy to jump around to an exact location so you can find what you're looking for without having to view the entire disk. Everyone who has lost a favorite memory forever by accidentally taping over it can breathe easy with DVDs - they are almost impossible to inadvertently record over. Press RECORD, and your DVD camcorder automatically starts recording at the end of your last shot. You never have to rewind or fast-forward before recording, so you never miss a shot and you never record over irreplaceable memories. Once your videos and pictures are burned to a DVD, you don't have to worry about them again. DVD-R or DVD-RW? Which disc is right for you? You can record the disc only once. You cannot edit or delete recordings. You can initialize your discs in VIDEO mode only. You can play your disc in most common DVD players. You can record the disc multiple times. You can edit and delete scenes. You can initialize your discs in VIDEO or VR mode. You can only play your VR mode disc in VR mode-compatible DVD players. DVD-R discs are tough and versatile and can be played back on most home DVD players. However, DVD-RAM discs allow you to record and erase just like videotapes. DVD-RAM discs can be played back in compatible devices only, like DVD players and computers. DVD Camcorders record onto single-sided (1.4GB) or double-sided (2.6GB) 8-cm discs. Some models can record on dual-layer DVDs (2.6GB) eliminating the need to flip-over the disc to the other side. Since DVD camcorders use a "non-contact" method to record and play, repeated playback doesn't affect the image quality like it can with videotape. Your favorite videos and images can be kept for years without any loss of quality. Plus, DVD-RAM discs can be rewritten approximately 100,000 times, making them an economical and ideal choice for repeated recording. In addition to moving images, most DVD Camcorders can record still images. These images can be stored on the same disc as your video recordings, enabling you to store all your memories from a special event conveniently in one place. You can also store your still photos on a memory card and then transfer them to a compatible PC for retouching or e-mailing. Always check the camcorder capabilities before you buy. Some will only record to DVD-R/DVD-RW while others will only record to DVD-R/DVD-RAM. Camcorders can shoot and play back video instantly on the camcorder or a set-top DVD player. They produce slightly lower-quality video than MiniDV camcorders; also, the video is more difficult to edit.  Video recorded on DVD-R cannot be edited on a computer.  Video on DVD-RAMs can be accessed only via a DVD-RAM drive.  Relatively short recording times at highest-quality modes and unpredictable recording times with variable bit rate.  Less support by advanced video-editing and -effects software than for MiniDV format.  A single-sided 8-cm DVD holds 1.4GB of video information or about 60 mins. of Long Play video quality. By contrast, a MiniDV tape holds about ten times as much information yet provides the same 60 mins. of video. How can this be? Because of the way the video information is stored on the DVD vs. the MiniDV tape. The DVD information must be compressed more than the MiniDV tape video information. The result is somewhat less video quality. DVD uses MPEG-2 compression in order to get all the information on the disc while MiniDV uses the DV standard. DVD Best for: those who want to make short films; and those who want to shoot without editing. Want to record High-Definition video on a DVD? 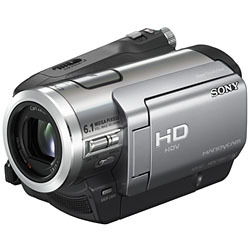 The Sony HDR-UX1 digital camcorder marks the first AVCHD camcorder to record directly to MiniDVD. AVCHD is the new HD format pioneered by Sony and Panasonic for recording HD footage onto multiple mediums like MiniDVD, memory card, and HDD. 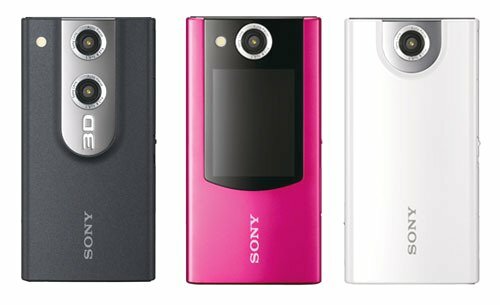 Sony hit the market first with their HDR-UX1 model in 2006 and followed in 2007 with the HDR-UX5 and HDR-UX7 models. The Sony HDR-UX1 records HD footage onto the red-laser 8cm MiniDVD and will also record onto the newer dual layer 8cm MiniDVDs, which will double the recording time. These are different than the double-sided 8cm MiniDVDs available now in that you won’t have to take the disc out and turn it over. Dual-Layer has 2 layers on one side rather than one recording surface on 2 sides. Footage is recorded at 1080i resolution. Component video as well as HDMI outputs are built-in along with a flash for still pictures. The camcorder will take Memory Stick Duo cards, which will allow stills of up to 4 megapixels to be recorded. The HDR-UX1 records audio in Dolby Digital 5.1 Surround Sound, and will also include a headphone and microphone jack. Better yet, the HDR-UX1 also features a manual focus ring, much like the HDR-HC1. Available: Sept 2006. Price: about $1,400 at introduction. AVCHD (Advanced Video Codec High Definition) is a high definition recording format introduced by Sony and Panasonic. It can use various storage media, including 8 cm (3 inch) recordable DVD discs, as well as hard disk, and SD and Memory Stick Pro memory cards, and is being positioned to compete with handheld video camera recording formats like HDV and MiniDV. AVCHD uses an MPEG-4 AVC (H.264) video codec. AVC's greater compression efficiency (when compared with the aging MPEG-2 codec used in HDV camcorders) allows AVCHD recorders to capture video using less storage. The audio track can be stored as uncompressed 7.1 linear PCM, or compressed AC-3 surround 5.1. The compressed audio and video data are encapsulated in an MPEG-4 Transport stream, called HDMV. Consequently, AVCHD recordings can be played without modification in most set-top Blu-ray Disc players, such as the Sony BDP-S1, BDP-S300, Panasonic DMP-BD10, and the PlayStation 3. For advanced users, digital video-footage is rarely edited in-camera. Instead, it is transferred to a PC, where the user runs a video editor application (such as Ulead's DVD MovieFactory, or Sony Vegas, Adobe Premiere or Apple's iMovie, Final Cut Express, or Final Cut Pro - none of which could edit AVCHD when it was first introduced) to edit the footage and burn the output to DVD. The recently released Canopus AVCHD Converter can convert AVCHD clips into a format which can be edited using Canopus' Edius 3/4. A related tool, Canopus ProCoder 2, can then perform an additional conversion that produces files which are usable by other video editing tools. Because of this limited availability of editors and converters (As of March 2007), AVCHD offers limited utility to the advanced user. Update: April 2007 - Ulead Systems' DVD MovieFactory 6 Plus (U.S. $79.99) now supports Sony AVCHD camcorders. CyberLink's PowerDirector 6, Sony Vegas 7.0e, Vegas Pro 8, and Vegas Movie Studio Platinum 8, Corel's Ulead VideoStudio 11 Plus, Pinnacle's Studio Plus 11, and Canopus' EDIUS Pro 4.5 video editing software support the AVCHD format. Currently the only consumer software that is able to edit AVCHD files is Nero 7 Premium. Nero 7 Ultra Edition Enhanced, is a software suite which contains the AVCHD editor Nero Vision. Also included in this suite is Nero Showtime, which plays AVCHD files natively. Nero Vision can convert AVCHD files to other formats such as MPEG-2 or AVI and can import them for use in video editing projects. Nero Vision can also export Sony's M2TS format to MPEG-4 files that can be viewed by Quicktime 7. Edited video can also be burned to DVD discs in AVCHD format for playback on hardware players or in Blu-ray format. The biggest problem in editing these files is the amount of resources they require. Once more programs make the switch to 64-bit operation, editing AVCHD should be easy. Sony has released two AVCHD camcorders, the HDR-UX1 (Mini-DVD) and the HDR-SR1 (30GB hard-disk) available since September and October 2006 respectively. Panasonic has released two AVCHD camcorders, the HDC-SD1 (with SDHC) and the HDC-DX1 (Mini-DVD). AVCHD can encode audio in either 5.1 channel AC-3 or up to 7.1 channel Linear PCM. The advantages of the AVCHD format over the current HDV scheme used with MiniDV cassettes are getting random scene access thanks to the nature of optical discs, but recording time is cut down from around an hour with MiniDV to only 20 minutes at the AVCHD "average setting". DVD players will require special software in order to read discs containing content encoded in the new format, and even then, they will only play back at a maximum resolution of 480p unless you buy new compatible players. Forget about blank media like tape or disc because a HDD camcorder is ready to record on a built-in disk drive. These models store your memories on internal 30 or 60 GB hard disk drives, with capacity for up to 40 hours of video (60 GB drive, Long Play mode). Hard disk recording has other benefits, including instant access to any scene without having to fast forward or rewind. You can play back your shots then return to shooting without stopping to search for the end of the last clip. (The camcorder automatically finds and records on the blank spaces.) After you fill up the internal hard disk, it's easy to copy your memories out to your PC, DVD burner or VCR and clear the drive for the next occasion. Additionally, you can give your memories the professional touch by editing them on a PC with compatible software. These camcorders protect the internal hard disk from the bumps, jolts, and shocks of the real world. For example, a shock absorber protects the hard disk drive in the event that the camcorder is dropped. After the camcorder recovers from a drop, the unit automatically records the contents of a buffer onto the hard disk drive. If you own or are considering a High Definition TV, then a High Definition camcorder should be on your shopping list. These camcorders can offer "Full HD 1080," a High Definition picture with a full 1,080 scanning lines, so you get more than four times the detail of Standard Definition. High Definition also supports a larger color range, for a range of reds and purples that other camcorders can't match. 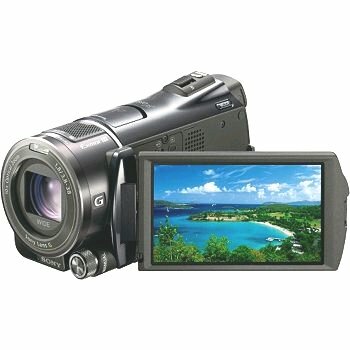 HD camcorders also capture a widescreen picture that matches the shape of HD televisions. HD camcorders also retain compatibility with Standard Definition televisions. They also convert HD for playback on conventional TVs. At your option, these camcorders can also record and play Standard Definition. HDV ™ camcorders: These record High Definition onto the same Mini-DV cassettes used in conventional, Standard Definition camcorders. MiniDV cassettes are compact, affordable, and available almost anywhere, including drug stores and supermarkets. An HDV version of the i.LINK® interface** enables you to copy recordings onto a computer for PC-based digital editing. Finally, a growing number of video editing software programs now support HDV camcorders. AVCHD ™ camcorders: These record High Definition video onto 3-inch (8-cm) DVDs or an internal hard disk drive, or flash memory cards depending on the model. DVDs recorded with the AVCHD system can play back on the camcorder, on the new generation of Blu-ray Disc™ players and on such Blu-ray Disc compatible products as BD-enabled PCs and the PlayStation®3 system. *** AVCHD camcorders also offer the USB 2.0 interface for rapid copying of material onto a computer for digital editing with compatible software. 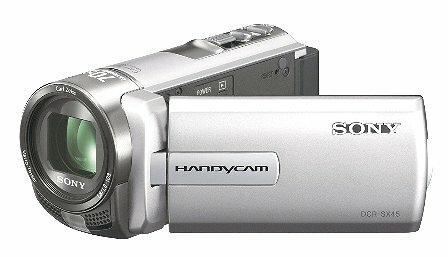 The HDV camcorders (such as the $1100 Canon HV20 or the $1000 Sony HDR-HC5) record high-definition video to the same MiniDV tapes that MiniDV camcorders use. And the video they take can be edited in most video editing programs, with some adding the ability to write the high-def video out to HD DVD or Blu-ray discs. Pros: These models shoot high-def video that's easy to edit. Cons: They're expensive--HDV camcorders cost two to three times as much as MiniDV ones. Best for: Makers of high-def home movies and lovers of HDTV. 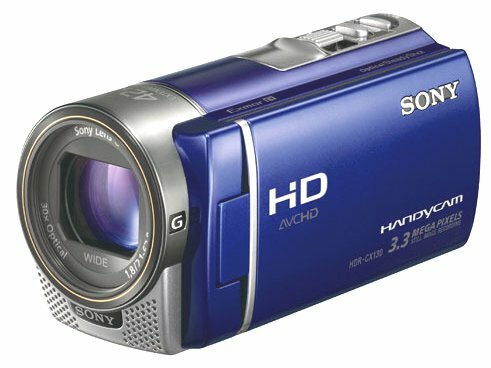 Many camcorders incorporate an SD/MMC or Memory Stick (Sony) slot for the purpose of storing still images and MPEG-1 or MPEG-4 video clips. Camcorders save photographs in the compressed JPEG format. For e-mailing and posting on the Web, MPEG-1 and MPEG-4 formats are best. Like Webcams, some camcorders can stream video in these formats directly to the Web. A few video cameras use these types of memory exclusively to achieve an ultracompact design. Because they record MPEG-1, MPEG-2, or MPEG-4 video only, they're best suited for gadget lovers who want to use their footage mainly on Web sites and in e-mail. Camcorders that record MPEG-2 or MPEG-4 to memory cards may be picky about the cards you use since those encoding schemes require the ability to write to the card more quickly than most standard cards can handle. Current capacities for these tiny storage cards range from 512MB to 8GB and more. Costs go from $20 to over $100 each. As of Feb 2008, a Sony 1GB Memory Stick card sells for $30. More expensive camcorders will rival a small digital camera with 4 to 6 MegaPixel image quality or better. The quality of video generated by a camcorder begins with the image sensor, a light-sensitive chip known as a charge-coupled device or CCD. The CCD converts light entering the camcorder lens into a digital signal, which is then converted to the format the camcorder uses. Less-expensive camcorders employ a single CCD chip, while higher-end and professional units use a three-CCD system. Consumer camcorder CCDs are rated in either inches (usually 1/4-inch or 1/3-inch) or by the number of pixels. The larger the CCD or the greater the number of pixels, the sharper the image recorded. A camcorder with three 1/3-inch 680,000-pixel chips, for example, will provide much sharper images and richer colors than a camera with a single 1/4-inch CCD at just 250,000 pixels. Look for a camera with a high quality lens, a large LCD screen and an excellent imaging device. All camcorders use solid-state imaging devices called a CCD (Charge Coupled Device) or CMOS (Complementary Metal Oxide Semiconductor) chip. They are the electronic heart of your camcorder. The chips are measured in pixels (picture elements) just like a digital camera and the more your camcorder has, the better the image will be. Many MiniDV camcorders have 680K pixel CCDs while more expensive models have Megapixel (one million-plus) or more imaging devices. Sony has a relationship with Carl Zeiss and Panasonic has one with Leica, two of the top lens makers in the world. Samsung's new DV camcorders feature Schneider Kreuznach lenses. Sony DV camcorders use Carl Zeiss Vario-Sonnar and Vario-Sonnar T* (T Star) lenses. They have a multi-layer coating system for less glare and lens flare compared to other systems. Top Panasonic camcorders feature Leica Dicomar lenses to capture crisp detail and accurate colors. Canon, a leader in still photography, uses the same quality lenses in its camcorders. What you see on your screen is a direct result of the recording capability of your camcorder. Picture resolution is the way we measure what you are seeing. Horizontal resolution is a measurement of detail in a single scanning line of a video picture (525 scanning lines make up the basic analog U.S. video system). The higher the resolution, the better picture you'll see. So watching a TV show with a high horizontal resolution specification means you'll see more detail in skin tones, fabrics, and gradations of color. Standard analog American TV broadcasts deliver 330 lines of horizontal resolution at best. VHS VCRs deliver anywhere between 240 and 270. It’s one of the reasons DVD players are so popular since they deliver close to 500 lines of resolution. Digital TV broadcasts offer even better quality than standard DVD (720 and 1080). Camcorders are now available in High-Definition resolution so you can get the most out of a HDTV. What should most buyers look for in a camcorder today? Digital format A digital camcorder provides the current capabilities and reliability that most people need in order to shoot and enjoy home video. Memory card, MiniDV (tape), DVD (8 cm) or built-in Hard-disk camcorders provide the best video recording. External microphone jack Not essential for most consumers but can come in handy in many shooting situations. Audio should not be overlooked in a camcorder. Headphone jack This feature is good to have if you want to hear the full audio you are recording. The small speaker on a camcorder simply is not enough to hear the audio. IEEE-1394 (Firewire or iLink) port This feature is good for sending digital video between camcorder and computer or DVD recorder. USB port USB 2.0 (and your appropriate software) allows you to send your audio/video from camcorder to your computer for archiving, editing or posting on the internet. Analog video port Needed so you can convert and record analog video to MiniDV format through camcorder. This is very useful if you need to convert footage from other formats, or need to export miniDV format to analog (VHS). 1/4" or larger CCD The CCD is the element that captures the video, the larger the CCD the higher resolution the video. Avoid the 1/6" or smaller CCDs. 10X Optical zoom Optical zoom is required for closeups - digital zoom is less important. 10X is the minimum. 12 to 18X is better. Manual focus Certain situations need this feature. Auto-focus simply can't handle all shooting environments. Manual exposure control The ability to turn off automatic exposure control and set the exposure manually avoids the problem of unintended exposure changes. Side or top loading tapes If you will be shooting video on a tripod, it helps to be able to load video tape without removing the camcorder from the tripod. This is only possible if the camcorder has top or side loading tray. Bottom loading tape transports require you to dismount the camcorder in order to load a new cassette. EIS or Image Stabilization A system for steadying the image as you shoot. Sensors in the camcorder send motion feedback information that shifts the image slightly to reduce small, jerky movements. Size Cameras that are too small can be difficult to hold, difficult to find the control buttons, and generally have smaller LCDs and optic systems. Look for a medium size camcorder. Name brand Choose a camcorder from a known company such as Sony, Canon, Panasonic, or JVC. Avoid the no-name brands.  Look at the overall appearance of your potential camcorder. Do you like the way it looks?  Does the camera body appear to be made of quality materials?  How does the camcorder feel in your hands? Too big? Too small?  Does it have a shoulder strap and hand strap?  How about the menus, touch screen or dedicated buttons, where are they located? Try setting up the different menu options and see the results. Check to see what features and options are available. Can you setup the camera with ease?  Try out the zoom control. Too sensitive or not sensitive enough? Is the image stable?  What connections are available? TV hookup , computer linkup, VCR or DVD recorder hookup, audio? Which computer operating systems are compatible with the camcorder?  Is the viewfinder to your liking? You may have to use it if bright sunlight washes out your LCD screen.  How does the LCD screen look, too small? What does the video look like on the screen?  How do you manually focus? Try a close-up shot, is it in focus?  Where is the record start/stop button?  How do you power on the camcorder?  Where do you load the media?  Can the camcorder accept a tripod?  Is there a video light capability for indoor shooting? 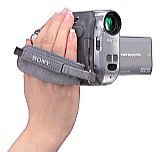  What about a lens cover and case to protect your camcorder?  Does the camcorder have a battery charger and AC adaptor?  How much does an extra battery cost?  How long will the battery last on a full charge?  How much does media cost?  What is the warranty?  And of course, what is the price? Is it a budget buster? Does the store offer financing? Comparison shop online for a good price. Consider sales tax and shipping costs in the total price.  Does the manufacturer have customer support available online and/or by phone?  Search online for a discussion group relevant to your camcorder to see if other buyers have experienced problems with the model. You will be amazed at how much you can learn by reading reviews.  Consider downloading the manufacturer's owners manual if available online. Again, you may find information which will make or break a particular model. Sony for one offers manuals online in PDF format for most of their current models. Recording speeds of HQ (High Quality) and higher will reduce the recording times accordingly but yield better video. Record 1920 x 1080 high-definition video and 12 megapixel still images directly to 64GB of internal flash memory. Additionally, the built-in GPS receiver lets you Geo-tag your videos and photos. The built-in 64GB embedded Flash memory can record and store up to 26 hours of high definition video footage (HD LP mode), or up to 48 hours of standard definition footage (SD LP mode). Store your memories with the ability to copy videos from your camcorder directly to an external hard disk drive (sold separately), all without a computer. Your camcorder can also access videos stored on the external hard drive for playback on your HDTV, allowing you to utilize the camcorder’s handy playback features. Mini-HDMI Output. Recording and Playback Times : 64GB Embedded Flash Memory: High Definition: FX= up to 360 min., FH = up to 465 min., HQ = up to 935 min., LP = up to 1595 min. Standard Definition: HQ = up to 965 min. Canon is going all flash memory for its 2010 camcorder lineup, while keeping last year's Vixia HV40 HDV tape product on the market. There will be 12 new models in total, including nine high definition and three standard definition models. Canon's HD camcorders are dubbed Vixia and the top of the line is the HF-S series. For 2010, all HF-S models will feature dual SDHC card slots with relay recording, which allows users to capture uninterrupted video by automatically switching recording to next available memory card when the primary recording source (internal memory or SD card) becomes full. They will also feature a new image stabilization technology dubbed Powered IS, which lets users lock the lens at the telephoto end of zoom once they have the desired shot. The HF-S series will also debut a new, 3.5-inch touch screen LCD. You touch a moving object in the frame and the camcorder will optimize focus and exposure on that object during filming. A new "Smart Auto" mode will automatically choose the best settings based on the surrounding environment. The camcorders will be compatible with Eye Fi wireless SDHC cards enabling wireless transfer of down-converted standard definition videos or photos to your computer or web. The advantages of flash memory go beyond the added recording time. You'll also appreciate the quick response time, because there are no moving parts. Press the record button and your VIXIA starts recording video faster than you've ever seen before. In addition, when you review, you'll have quick access to your video footage. * HF S21 ($1,399) offers 64GB of internal flash memory, a viewfinder, a 10x optical, 1920 x 1080 recording at 24MBps and an 8-megapixel sensor. * HF S20 pares back the internal memory to 32GB and loses the viewfinder for $1,099. * HF S200 records directly to SDHC cards with the same features as the HF S20 for $999. Vixia HF M-series is a step down from the HF-S. Its camcorders will include a single SDHC card slot, 24MBps HD recording, a 2.7-inch touch-screen LCD with touch and track and a 15x optical zoom lens with Powered IS. Models with internal memory will feature relay recording. * HF M31 offers 32GB of internal memory for $799. * HF M30 will offer 8GB for $699. * HF M300 records directly to a memory card $679. Vixia R-series of HD camcorders will feature a 20x optical zoom lens, 1920 x 1080 recording at 17MBps, a single card slot and 2.7-inch LCD screens. Models with internal memory will feature relay recording. * HF R10 will have 8GB of internal memory and retail for $549 and comes in three colors: black, red and white. * HF R100 records direct to card for $499. In standard definition, three new models will offer 41x advanced zoom lenses. The FS31 ($349) boasts 16GB of internal flash memory. The FS30, 8GB and the FS300 ($299) records direct to SD cards and comes in silver, red and blue. Canon's flagship VIXIA HF S21 Dual Flash Memory Camcorder, with a 64GB internal flash drive and two SD memory card slots, offers Canon's most sophisticated feature set to date. Canon's superlative proprietary imaging technologies deliver video and 8.0 megapixel photos. Native 24p Mode perfectly matches the frame rate of film. And 5.1-Channel Surround Sound* ensures your audio complements the realism of your video. 64GB internal flash drive: Recording time based on internal flash memory only. Greater capacity is possible when SD memory cards are also used (2 card slots). FXP (17Mbps) 8 hours 20 minutes. Allows 1920 x 1080 Full HD Recording. MXP (24Mbps) 5 hours 55 minutes. Allows 1920 x 1080 Full HD Recording. Over the years, videotape cassette sizes have gradually been reduced in size from the now obsolete (for camcorders) VHS cassette to the slim MiniDV size, making camcorders easier to handle while providing improved images. Launched by Sony in 1995, DV (or Mini-DV) is the most popular consumer digital video format. 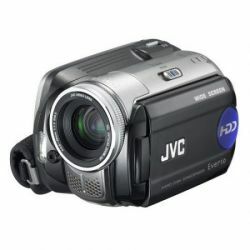 DV camcorders provide what is arguably the best quality of all of the home video formats, with all models possessing the capability to transfer video signals out to another device (such as a Windows or Mac computer) via FireWire – also known as i.Link. Uses small tape based videocassettes. This format was introduced by Sony in the late 1990s and uses 8mm videocassettes (as used by Hi-8 models) to record and replay a video signal identical to DV. Signals use FireWire (i.Link) to transfer a DV-specification signal out and – where appropriate – back in to the camcorder. Some Digital-8 models will enable users to insert standard analog Video-8 and Hi-8 tape recordings and play them back, in addition to converting the signals as they are passed via FireWire to a computer for editing. Note that Digital-8 is a format that is being phased out by Sony, so consider with caution. Hitachi first launched camcorders that record to 8cm DVD discs back in 2001, and several other major manufacturers soon followed suit. Like MICROMV, DVD camcorders use MPEG-2 compression prior to writing the signals to disk. One of the major problems of DVD camcorders has been the compatibility between DVD camcorders and home DVD players, though these are quickly being resolved. If you're planning to import your DVD footage into a computer for editing, you should note that editing DVD (MPEG2) compressed files is much more difficult than it is when working with a tape-based format like DV or Digital-8. JVC started the Hard Disk recording camcorders trend. The Everio G camcorder range is a good example of camcorders which uses tiny internal hard disk drives very similar to the larger ones used in all computers. The company's GZ-MG50 model enables recording of up to 7 hours at best quality. Apple's iPod MP3 players use very similar technology and provide a similar level of interactivity with the files saved. HDD camcorders save files which can then be deleted, moved and transferred just like those on your computer or iPod. They also provide much more flexibility. Sony also offers HDD models with 30GB, 60GB and more capacity, giving you hours and hours of recording time. Also known as CardCams, these camcorders don't have any moving parts, tape, disk or otherwise. Instead, they record a compressed video stream to either a built-in memory chip or to a removable card, such as an SD card or Memory Stick card as used in many digital still cameras. 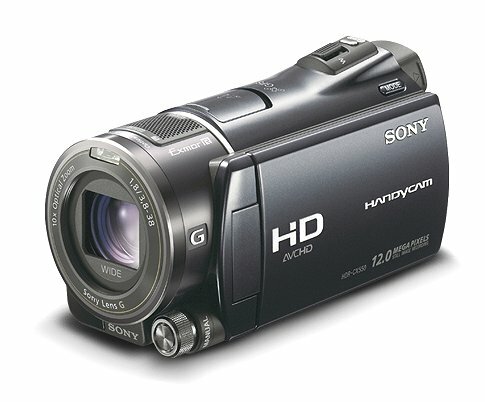 The Sanyo Xacti and the Sony HDR-CX7 are examples of a Solid State camcorder. MICROMV is a format that was introduced by Sony with great optimism in 2001 that uses cassettes that are 70% of the size of MiniDV cassettes which records in a format called MPEG-2, which is similar to that used in DVD discs. Although the limited number of MICROMV camcorders available contain i.Link connectors, it isn’t possible to transfer video to a computer without the use of special computer software (other than supplied by Sony with its models). The Sony MICROMV format has been discontinued. These are two formats that are based upon DV but which use a higher-specification recording system to produce pictures that are acceptable to broadcast TV channels and professional video producers. DVCAM is Sony's format, while DVCPRO is a format that was pioneered by Panasonic. This new format introduced by Sony and Panasonic uses MPEG4 to record to mini-DVD or internal hard-disk or memory card. High-Definition capable. Camcorders are expensive but have new features such as HDMI connections. LUX - A unit of measurement that gauges the amount of light falling on a photo subject. Many camcorders have a low-light level rating of around 10 lux, which is the amount of light on a subject about 12 feet from a single 60-watt light bulb. Sensitive camcorders can deliver a picture at 1 lux, but you are most likely to get a good image with 80 lux. The best color and depth of field require several hundred lux. For many years, manufacturers have played a lux war game, with each claiming the lowest lux level although there was no real standard in place for measuring lux. There is now a standard in place called EIA-639. New literature will state lux as "measured by the EIA standard." This means brand A's 3 lux will be equivalent to brand B's 3 lux if they both state their lux as measured by the EIA standard. PIXEL - One picture element. One of the tiny points (or dots) that make up a video image. A high pixel count produces a more detailed image, but because the size and type of imaging devices vary, comparing pixel counts between different devices doesn't always determine which can yield the most detailed image. * Playback on all home DVD players, computers, and DVD drives cannot be guaranteed. Some players, drives, and video game consoles lack the ability to read due to the optical reflection standard of DVD-R/RW disks and/or due to encoding incompatibilities. ** i.LINK® is a trademark of Sony used only to designate that a product contains an IEEE 1394 connector. All products with an i.LINK® connector may not communicate with each other. *** Do not use AVCHD recorded DVDs in conventional DVD players. A conventional DVD player or recorder may fail to eject an AVCHD recorded disc. A DVD recorder may erase an AVCHD recorded disc without warning.